September 1, 1934 – Bethesda Mission moves into the PA Railroad YMCA building at 611 Reily Street. 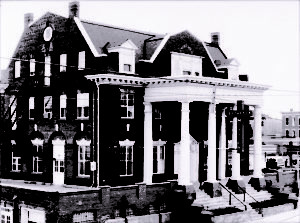 The impressive building that housed the Railroad YMCA at 611 Reily Street stood for 3 decades in service to the railroad men and their families. The purchase of the building by Bethesda Mission on September 1, 1934 was made possible by many small gifts and several bequests, especially that of Mr. and Mrs. Wesley L. Forry in the amount of $10,000. After its purchase in 1934, the building at 611 Reily Street had been remodeled and admirably adapted for Mission work. There was a fine suite of rooms for the Superintendent and his family and a beautiful chapel seating 300. There were also other rooms and dormitories set aside for Mission use.